We go back to school in 9 short days. I’m struggling to make peace with the things on my summer list that may not get done, but I’m also excited about the prospect of a new year and new school supplies! Confess now–I know some of you also find new markers, new notebooks, and shiny new colorful things to be nearly irresistible! One of the things on my docket in the first week of school is to set up the apps that I use on a regular basis in class. They serve very different purposes, but each of them is now an invaluable tool for our classroom. Today I’ll tell you about Remind (formerly Remind 101), and Quick Key. We’ll talk about PikMe, Word Reference, and Evernote in future posts. All are available as apps for iPhone/iPad, and I believe that all (except Pikme?) are available for Android as well. Remind: Remind is a safe, one way messaging platform that provides a way to communicate via text with students and parents. They can see messages that you send out, but cannot reply. This means that you can send a message from your phone but they can’t see your number. You can also log in to the Remind site and send a message that way. Messages can be scheduled, too, so it’s easy to set up recurring reminders as well as to set up several days’ messages all at once. Getting started: sign up for an account linked to your school email. Then create as many groups as you would like. You could use one group per class, and then set up subgroups. We also have used it to communicate with teams and clubs as well. Remind will provide you with a code that you give to the people who should enroll in the group. Once they have the code, they self-enroll via text message, and you are good to go! 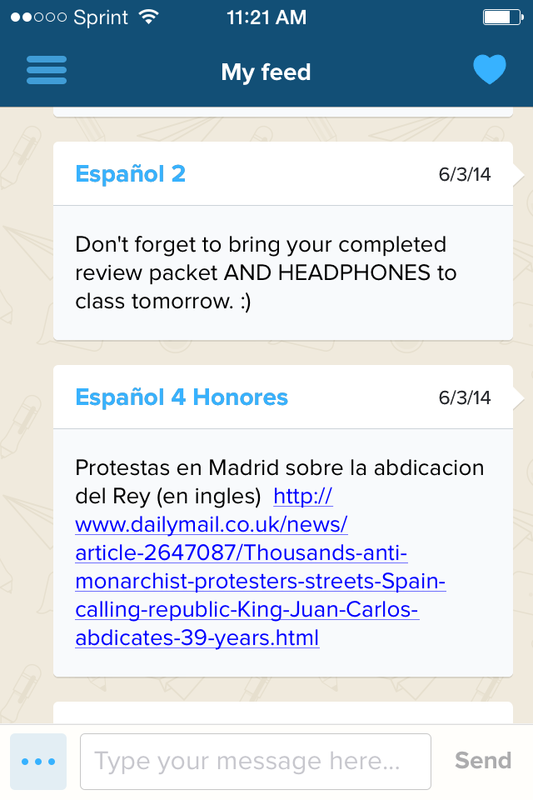 You can send messages to whole classes, or to small groups, as long as you have at least three people in the group. Remind has recently gone through some significant upgrades–you can now attach files and send links in your messages. Makes it easy to send missing work to a student and his parents! QuickKey: QuickKey turns your phone or iPad into a scantron scanner and disaggregates the data for you. Simple and sweet, it allows me to get instantaneous feedback about my students’ performance on right/wrong types of questions. Though I don’t use much of this type of assessment for the upper levels, it is a valuable type of formative assessment for the lower level classes. Anything that can be turned into a/b/c/d/e answers can be graded this way, and it literally takes seconds to scan once your classes are set up. Some examples that I’ve used have been listening prompts where students match a picture to the descriptions they hear, multiple choice reading comprehension, and even “which one of these is not like the other” vocabulary practice. Since there is such a demand for “data” in our classes, this allows me to collect data that can be helpful for redirecting instruction even in a CI-oriented classroom. See the screenshot below: which questions do we need to revisit NOW? Getting started: Sign up for an account here. Create your classes and add your roster. Print the roster! Each student will receive an unique ID # that they will need to fill in on the answer sheet, and experience has shown that they don’t remember it. Download the answer sheet here, then print it and make copies. You can also copy/paste it into other documents, embedding it in handouts and assignments for students. (See an example here.) Outside of the app, make your assessment. Return to the app and create the answer key. Administer the assessment–have students use black pen or marker to complete the answer sheet for best scanning success. When you are ready to scan, open the app, select the class/assessment, and scan away! You will have an entire class’ results within seconds. Though it is generally intended for formative assessment, I used QuickKey to grade the listening assessment portion of our final exam last semester. We had a very fast turnaround time for finals, and using QuickKey was very helpful in delivering results quickly and reducing stress. It can also be a good tool for pre-testing to direct instruction. No need to review all of level 2 with my incoming level 3 class–QuickKey gives me another tool to strategically assess some of our key concepts to see what things we can highlight and which things we might need to reteach. I hope that these apps will help you as much as they have helped me. Stay tuned for part 2!